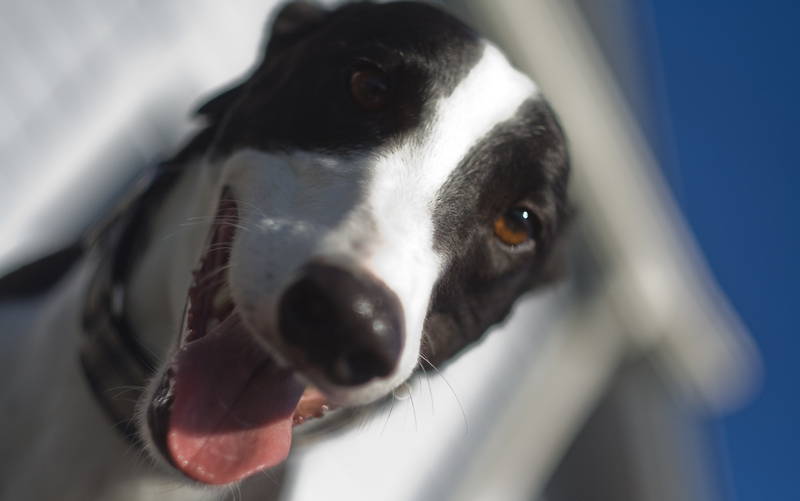 In July this year, a very special greyhound arrived to GAP: Baz ( Sub Class), trained by Steve Clark and Kathy Wilson, had 82 starts and an amazing racing record. I have to admit that a few of us made a special trip to GAP kennels just to meet this doggie! 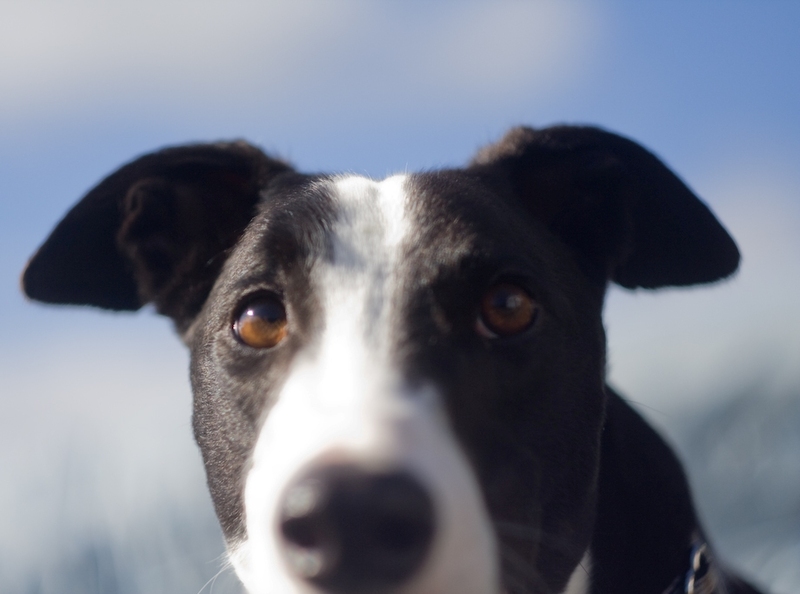 Jamie and I fell in love with the Greyhound breed about a year ago. We were completely smitten when we saw a lovely woman walking her dog in Mt Vic, she told us all about GAP, and more about the breed. 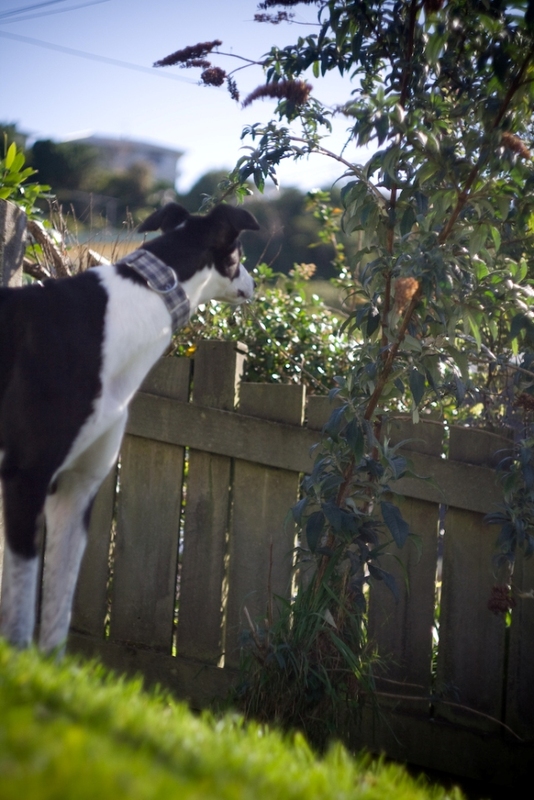 We were renting a little house in Mt Victoria, and thought it would be perfect for a giant dog. Sadly, our landlord disagreed. So...we moved out, and bought our own house, just so we could start our family of pets! Basil (Formerly known as BAZ) has been with us for 5 weeks now. Driving up to Sanson to collect Basil was one of the greatest days of my life! 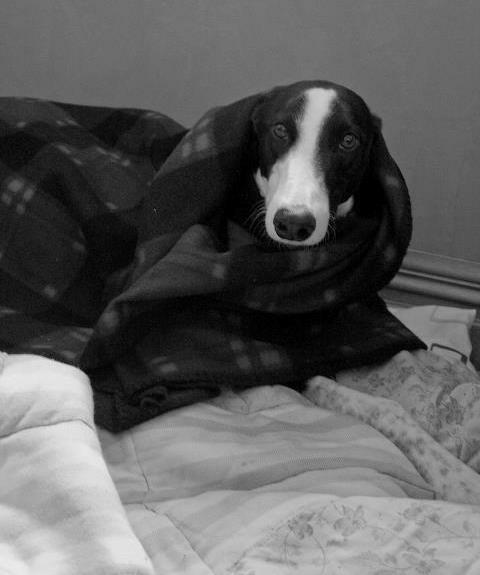 What a truely awesome day it was, meeting awesome people and AWESOME greyhounds - and beautiful Basil. We loved him as soon as we saw him. Basil really is the sweetest little boy. He LOVES going for his walk everyday. I take Basil for a 45 min walk during the day, then most evenings I will take him for a 15 min walk to the bus stop to meet Jamie. Basil Loves his daddy, and watching Basil's tail wag immensely as Jamie hops off the bus is cutest thing. Basil is very good on the lead, walks right beside us which is fantastic. Everyone loves Basil, and he gets stopped a lot for pats and cuddles from strangers we meet out on our walks. Basil's gran bought him 3 squeeky toys when he first arrived. He only started to play with them in the 3rd week. He LOVES his squeeky toys. 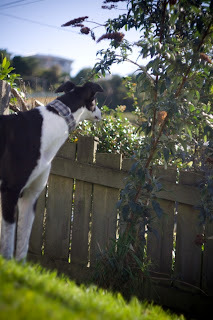 I could be way down the other end of the backyard while Basil is in the front yard - squeek his toy (ever so slightly) and he will come SPRINTING ready to play. Basil really is a character. He has recently discovered the TREATS drawer. Its always interesting watching him trying to get into it. He waits for us to get up in the morning now, at first he whined a bit, we thought it may be his way of telling us that he needs to go to the loo, but he didn't. He just wanted attention. Just took a few "ARRRCCCKKKKSS" to stop that behavior. We are still working on re-calling Basil out in public places. He is great at home and will come to his name from anywhere around the house in or out...but public places....(especially dog parks) is tough. He gets quite distracted from all the smells. We plan to take him to a friends house with a big back yard and do some training with him there. Other than that, it has been smooth sailing with Basil.